Edge is the grade 4-7 ministry at Southside which takes place on Sunday mornings and special Edge events throughout the year. Once a month Edgers participate in EdgeIN where they participate in various roles of ministry and service during a Sunday Gathering. Monthly, we also partner with the Shire Music Centre for Edge Jam night, where kids are encouraged to try new instruments, learn new songs together and explore what it means to worship God with our talents. 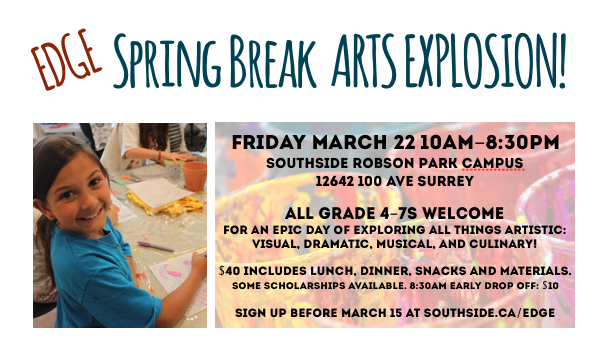 SPECIAL EVENT: SPRING BREAK ARTS EXPLOSION on MARCH 22, 2019 at ROBSON PARK! Click here to register before March 15.